In August last year BBC Radio 3 asked listeners to suggest the names of composers who had not been featured in past programmes of ‘Composer of the Week’ which was celebrating its 70th anniversary. Among the names I suggested was Mieczysław Weinberg. I was not alone: more than twenty people made the same suggestion. Imagine my delight when from 1-5 June he was featured. During that week I learned a lot more about this fascinating composer and his brilliant music. I have been a fan for many years ever since I first encountered his Violin Concerto and was struck by his incredible musical vision and sumptuous melodic invention. Many people seem to think that he is a mere clone of Shostakovich who was his friend and mentor. In fact each learned from the other and I am quite happy to say that for me he is the other great composer of the twentieth century along with Shostakovich. That will undoubtedly be considered a controversial statement but I am quite ready to defend it. Anyone who listened to those programmes will not find it so hard to accept even if it is always difficult to believe that someone who has not had the same degree of exposure can be put alongside someone who is so well known. There is no doubt that at last his star is in the ascendant. Soon we will all be able to see just how people like me can be bold enough to make such statements. The sheer magnitude of his work shows the justification for considering that he might be a great composer rather than a footnote: 26 symphonies, 17 string quartets, 7 operas, several concertos, around two dozen song cycles and a host of other chamber and instrumental works. His works appear on around 20 Naxos discs and 10 from CPO as well as those from other labels like ECM, Grand Piano, Divine Art, Melodiya, Russian Disc, RCA, Channel Classics, Toccata and others. This at last enables a wider assessment of his worth in the eyes of public, music pundits and movers and shakers alike. Having nailed my colours firmly and irrevocably to the mast I’ll turn to the music on offer here. Dating from 1966-67 his Trumpet Concerto’s first movement, subtitled Etudes, opens with a boldly burlesque circus-like knockabout tune. It’s immediately attractive and engaging with the orchestra responding in similar style. This gives way after five minutes to a more introspective tune from the soloist though later the music harks back to the jaunty beginning via an energetic dance. The movement concludes emphatically. The second movement, Episodes, is immediately a more serious affair. A flute opens with a plaintive tune taken up by the soloist with muted trumpet and accompanied by strings and woodwind. A more martial tone is then assumed and the trumpet, shed of its mute joins with this mood while a flute hovers above as a kind of counter. Eventually the music returns to its more confident attitude before closing with the flute’s plaintive note reappearing together with piccolo, harp and gentle brushing of a side drum. The last movement, Fanfares, emerges seamlessly out of the second with bells in the background and the trumpet playing seven notes from Mendelssohn’s wedding march. These are recalled several times, once also on cello. Then, accompanied by side drum and woodblock, the trumpet begins an elaborate and witty cadenza. 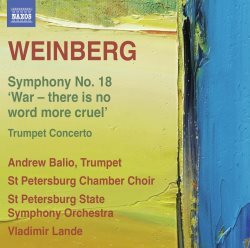 Finally the trumpet, enjoined by various members of wind, strings and percussion, moves the movement towards a conclusion with references to the concerto’s opening tune, though in a much more subdued mood. The percussion bring an emphatic full stop to the work. Weinberg, through bitter and terrifying personal experience, had an understandably passionate and deeply felt hatred of war. His 18th symphony is the central one of a trilogy which bears the collective title of On the Threshold of War. While it made no attempt to be a sop to the authorities the symphonies met a need on both State and personal levels. Symphonies 17 and 19 entitled Memory and Bright May are purely orchestral while the eighteenth War – there is no word more cruel is a choral work which uses texts by poets Sergey Orlov (1921-77) and Alexander Tvardovsky (1910-71). The Eighteenth Symphony opens with the only purely orchestral movement in an extremely sombre mood, firstly with the lower strings. Trombones and trumpets come in later to be joined by the upper strings and the movement continues in this deeply reflective way. Eventually the music increases in tension becoming restless. The full orchestra is joined by the organ all spiralling upward until muted strings take over in a gentle postlude to close the movement in a similar mood to that of its opening. “War – there is no word more cruel. War – there is no word more sad. In the sorrow and the glory of these years. This final movement is short but very telling with the voices unaccompanied for the most part, later on with some discreet brass in the background. These two contrasting works offer a further glimpse into the musical world of this composer whose works are gradually emerging from the shadows to claim a much deserved place in the public’s consciousness. The orchestra and chorus perform extremely well as does Andrew Balio in the trumpet concerto. When I heard it on the radio programme I was even more struck with the performance by the work’s dedicatee Timofei Dokshitser who seemed to have an extra edge to his playing. This recording is still well worth having for its interesting pairing and fine playing by all concerned, including Balio. 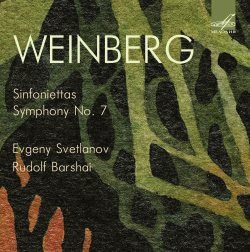 In amongst what seems an almost continuous spate of Weinberg releases comes a wonderful disc that includes both his sinfoniettas for orchestra. The First Sinfonietta was dedicated to friendship of the peoples of the USSR, a frequent and genuinely motivated theme among many Soviet composers. The first movement bursts into life with a frantic dance and is an ebullient celebration, full of Jewish folkloric references. The second is a much more subdued affair with melodies from the cultures of other peoples in the Union. The short third is again a merry tune that is full of life while the final movement is back once more to the rumbustious nature of the opening movement with allusions to music from the peoples of central Asia. The whole work is imbued with a sense of fun and the joy of life with Weinberg’s customary facility for coming up with great tunes served up in a constantly appealing way. The Second Sinfonietta was written twelve years later and dedicated to Rudolf Barshai, founder of the orchestra playing it here, the Moscow Chamber Orchestra, under its dedicatee. It is brilliantly scored. It is a generally much more ‘serious’ work than the first and the opening movement has an urgency about it that persists throughout while the second creates a rather brooding atmosphere. The third which opens with a solo violin is a serious and reflective one while the finale has a lyrical waltz-like main theme that wanders along creating a sad feeling of loneliness. The final work on the disc is the Seventh Symphony, also dedicated to Barshai (as was his 10th) and is scored for harpsichord and strings. Cast in the neo-classical mode this five movement work is unusual for its use of the harpsichord in a ‘modern’ work though there have been others since the harpsichord came back into favour in the 1920s with the undisputed queen of the harpsichord Wanda Landowska commissioning concertos for it by Manuel de Falla (1926) and Francis Poulenc (1927-8). These gave an impetus to the composition of others by such composers as Walter Leigh (1934), Bohuslav Martinů (1935), Frank Martin (1951-2), Jean Françaix (1959), Henryk Górecki (1980) right through to Philip Glass (2002). I particularly recommend the Walter Leigh concertino for harpsichord and orchestra with its wonderfully and quintessentially English feel, a work I’ve adored since first hearing it many years ago. Weinberg’s symphony uses the harpsichord as another component rather than as a solo instrument but it makes its mark nevertheless. The writing for the strings is wonderfully rich and at times dense with the harpsichord entering a dialogue with the orchestra at various points. While this symphony is by no means as profound in its character as many of his others it has darker passages as well as its moments of lyrical beauty and is a valuable addition to the growing number of recordings of his symphonies and the inclusion of the two sinfoniettas is a wonderful thing. The works on this disc could probably benefit from further remastering since the sound here is somewhat muddy. And so to the third disc of Weinberg’s music in the present batch. It is really interesting and comprises his Trio for violin, cello and piano (1945), his Sonatina for violin and piano (1946) and the Sonata for double bass solo (1971). There are four other recordings of the trio available but they are all coupled with Shostakovich’s. While that is an obvious coupling it is so good to have the two other works on this disc that would otherwise be more difficult to find. That his trio was his op. 24 and the Sonatina his op. 46 when there was only a year apart in their composition shows his speed of writing. This is proof of a driven man. The Trio opens with one of those moments when you could be forgiven for thinking that you were listening to Shostakovich. In fact Weinberg had only met him a couple of years before he composed it. Weinberg’s music generally lacks the angst, poignant and pointed references with which his friend and mentor laced his works although the trio is one of the exceptions. 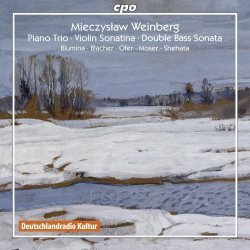 What is quite clear here is that the music mirrors Weinberg’s internal suffering. This was caused by his frantic move by foot from his native Poland into the Soviet Union to escape the oncoming Nazis and the separation, first from his parents and then from his sister who had fled with him but who had returned home when the going proved too tough. None of them was ever seen again and subsequently Weinberg discovered they had been murdered in the death camps. The music then is understandably bleak but heart-achingly beautiful, full of Jewish folk quotations particularly in the final movement. It is an absolutely brilliant work full of the most superb music that never lets go from beginning to end. There is a frantic urgency here which drives relentlessly in the first two movements and then becomes much more introspective in its third subtitled Poem. Here the cello outlines the melody with plucked violin strings accompanying in the manner of dripping water before the roles are reversed and the violin takes charge. The atmosphere intensifies with the piano sharing in this as the music comes to a towering culmination and then subsides into sad reflection full of mournful chords at its close. The finale in its fugal approach pays an obvious homage to Bach and while generally more upbeat in nature still carries that thread of melancholia throughout; this despite some Jewish dance music four minutes in that injects a few brief moments of joy. As the movement heads towards its conclusion the piano sounds a slow almost funereal note with the violin in its upper register allowing for a whispered finale. The Sonatina for violin and piano opens with a deliciously and lyrically beautiful main theme. This is fairly upbeat until a hint of sadness denotes a descent into a darker place. The second movement picks up on this with another lovely though splenetic theme which once again runs counter to his normal mood of hopeful optimism. Half way through, however, the music speeds up and one is left to consider, as pianist Elisaveta Blumina writes, that this may all be linked to his wartime experience and flight from his home. The pace slows again towards its conclusion in an atmosphere of bleakness. The third and final movement begins in a jaunty enough way though with darkness shading it. As Blumina again points out it concludes in the key of D major and recalls the opening theme. This all indicates Weinberg’s constant striving to find light within the darkest places. The concluding work on this wonderful disc is by any standards an unusual one for solo double bass. There are only a relative handful of works written for the double bass as a solo instrument in a concerto let alone as a truly solo one. In fact there have been a couple in recent years, Mario Davidovsky's Synchronisms No.11 for double bass and electronic sounds and Elliott Carter's Figment III, for solo double bass. Weinberg’s Sonata for double bass solo from 1971 is a full-blown composition comprising six movements. It is a magnificent work chock full of gorgeous harmonies and a fabulously rich and sumptuous sound. The double bass is given things to do that can only have been imagined before hearing it. Sometimes it sounds like a cello and even, believe it or not at times, akin to a viola. Anyone who loves Bach’s cello suites — and who could fail to? — will marvel at this work which explores the instrument’s capabilities in a thoroughly original way. Weinberg wrote seven other sonatas for solo instruments in the 1970s for cello, viola and violin. This one certainly whets the appetite to hear all the others. So eight works on three discs ranging from a concerto, two symphonies and two sinfoniettas to a piano trio and two sonatas all of which are played with commitment and brio. Apart from the aforementioned somewhat muddy sound on the Melodiya disc the sound on the other two is excellent. I particularly enjoyed the CPO disc and always find that photos of the players are helpful. It was however a bad idea on CPO’s part to have Elisaveta Blumina pose as if she were some sort of coquettish siren on the booklet’s back page. Fortunately her wonderful playing and scholarly notes give her the credibility she undoubtedly deserves. Her fellow musicians also meet the challenges of this wonderful music in spades. The more I hear of the breadth of invention and original ideas that Weinberg created the more I am convinced that along with Shostakovich he is the greatest composer to come out of the Soviet Union and one of the greatest composers of the twentieth century full stop. The plethora of recent releases is further evidence of this. I am sure this will one day soon lead to a really in-depth assessment that will reinforce my opinion. I hope so for I believe it to be incontestably deserved.